Puzzled and bemused looks are the norm for travelers who happen upon this location in Central Kansas. And for sure, the structure and it’s “unique ornamentation” is – shall we say – just a wee bit bewildering. Questions abound. What the heck is it? What’s it all about? Uninformed visitors would never likely guess that they have happened upon The Garden of Eden. Unlikely as it seems, and contrary to most authoritative religion and history scholars, The Garden of Eden is located in Kansas. ( I know – I mean, who knew? ) It’s sort of midway between Kansas City and Denver. 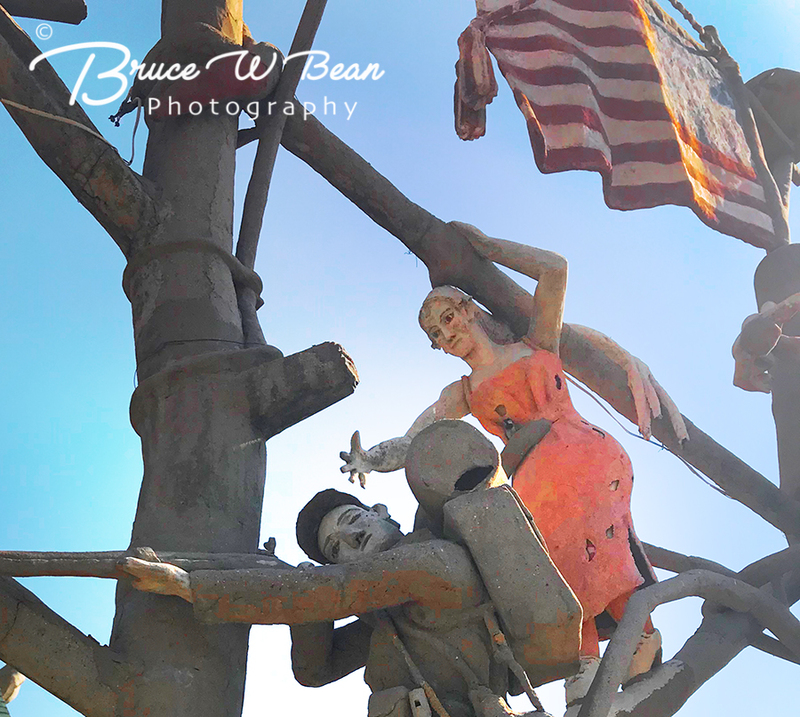 To be more precise, it’s located on the southeastern corner of the intersection of East 2nd and North Kansas Streets in Lucas, Kansas. 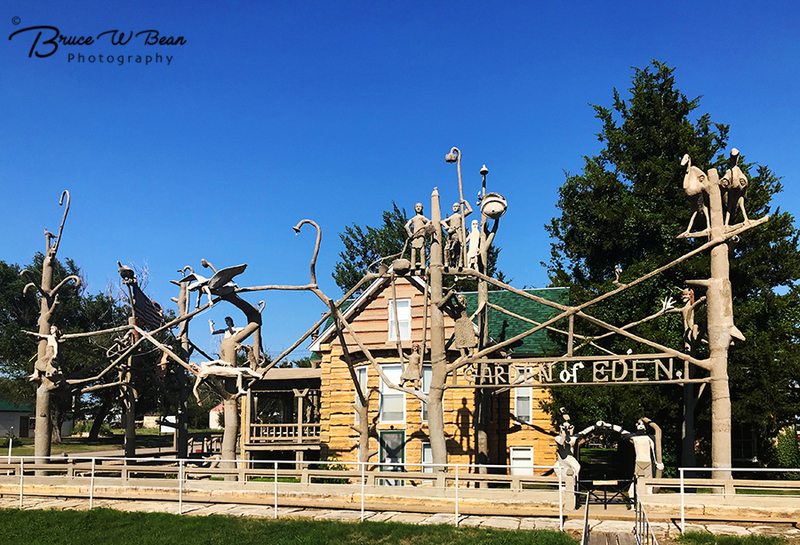 Heck, The Garden of Eden even has an address -305 E 2nd St, Lucas, KS 67648. And if you are a GPS aficionado here you go – 39°3′33″N 98°32′4″W. Of course most people don’t even know that The Garden of Eden is located in Kansas. This is “fly over” country after all. The entire State of Kansas is often missed by travelers as they jet their way from one coast to the other, catching a nap while Kansas floats past, unseen, beneath them. Road travelers miss out on The Garden as well. Intent on speeding from Point A to Point B as quickly as possible, they blast on down Interstate 70 as it slices across Kansas from Kansas City to Denver. Little do they know that just a mere 16 miles north of the Interstate on Kansas Route 232 lies The Garden of Eden. 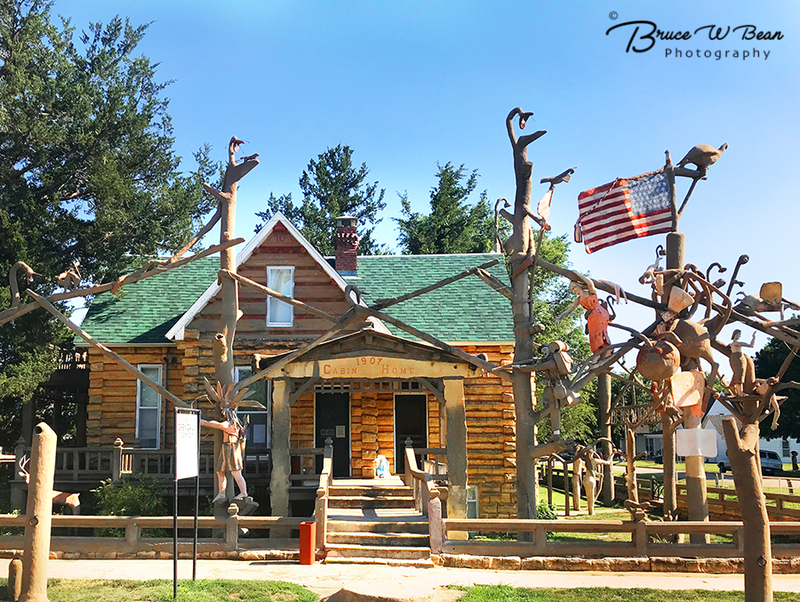 The adventurous few who do wander into Lucas, Kansas encounter a truly distinctive curiosity – so distinctive in fact that it’s actually listed on The National Register of Historic Places . It’s official name is S.P. Dinsmoor’s Garden of Eden. (And yes, it even has it’s own web site – so click away.) 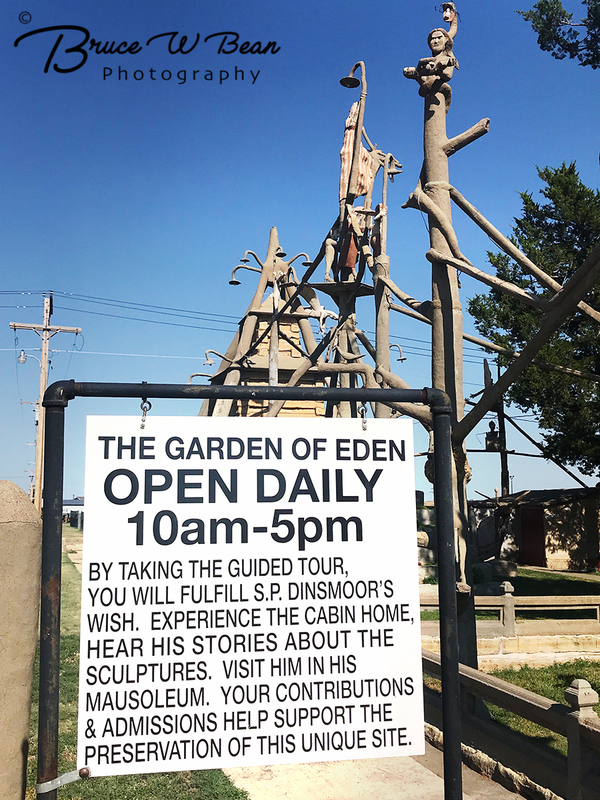 As that name implies, this Garden of Eden in Lucas Kansas is the brainchild of Mr. S.P. Dinsmoor. 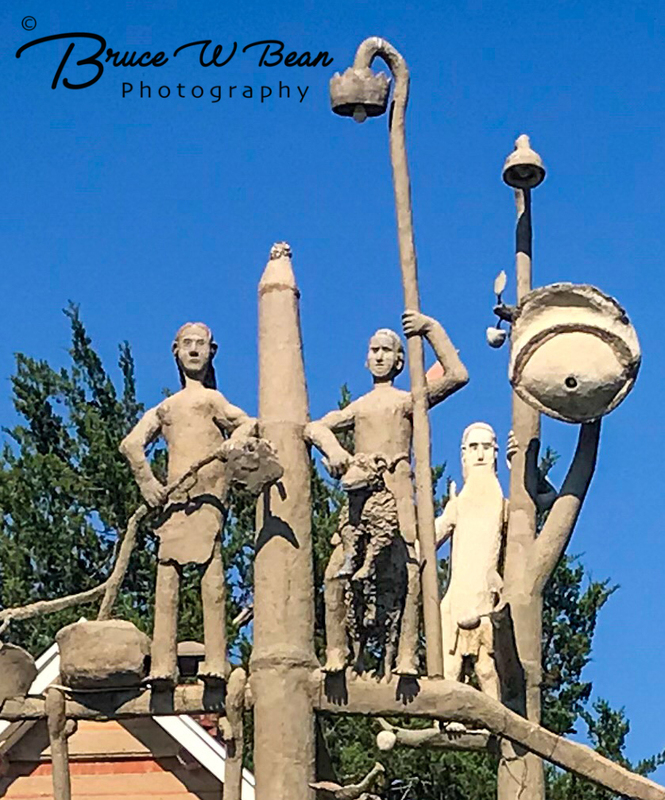 It seems that in 1904 (others say 1907) , around the age of 64, when he retired from teaching and turned his efforts toward sculpting, he began developing his home and unique sculpture array. His Garden of Eden is constructed from concrete – around 113 tons of it by some reports. It was completed in 1928. The Garden of Eden is a very odd but truly intriguing visual experience. The photos which follow give only a slight sense of the place. If you would like more detailed information about Mr. Dinsmoor – his history and motivations for producing The Garden of Eden – I suggest you visit their website – The Garden of Eden. Close inspection of the individual sculptures reveals details which are curious and puzzling as well. 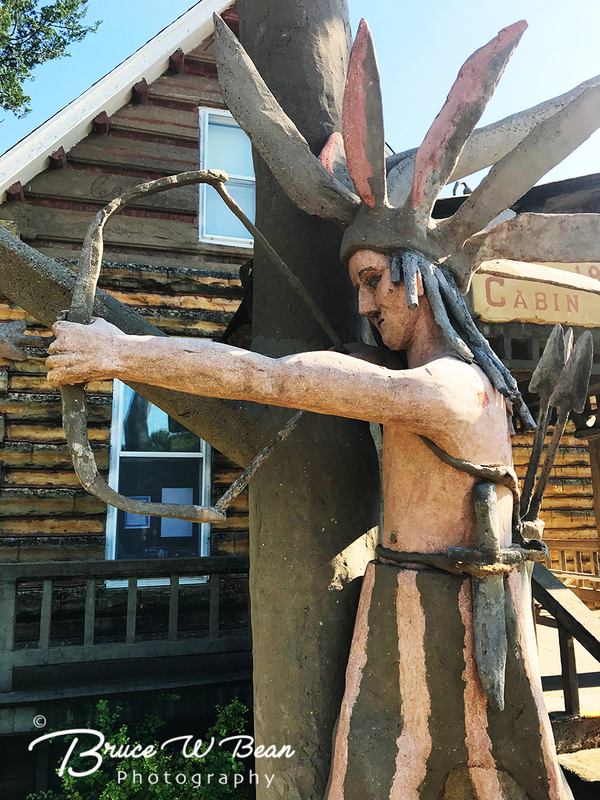 You can stop by at any time and view the sculptures and displays which surround the home. Be sure to examine the details and walk the entire perimeter of the place. If you time your visit well, you can even take a guided tour. Hours do vary according to season so be sure to consult their website if you plan to visit. Dinsmoor’s Garden of Eden is truly an interesting and very curious spot. If you enjoy Off The Beaten Track Travels it might be just the thing to add to your bucket list. Visit The Garden of Eden …………And Enjoy The Adventure! Click Here ............ Subscribe Today! WANT A DRONE? GET A SPARK! COORS BREWERY TOUR – Free Coors Beer! Hope you enjoyed the article. Please leave a comment, make a suggestion, offer your opinion. Don't forget to Subscribe (above) to get new articles delivered directly to you via E-Mail Come Back Soon ................... Enjoy The Adventure!